Amsterdam may be known as the ‘Venice of the North,’ but it’s safe to say that the Dutch capital lags behind Italy in the culinary department. If you’ve tasted the stodgy reheated pizza slices sold around Amsterdam’s top tourist spots (Looking at you New York Pizza), you’ll know you’re a long way from the Mediterranean. But did you know that it’s actually possible to get great pizza here? Real, hearty, Italian pizza? 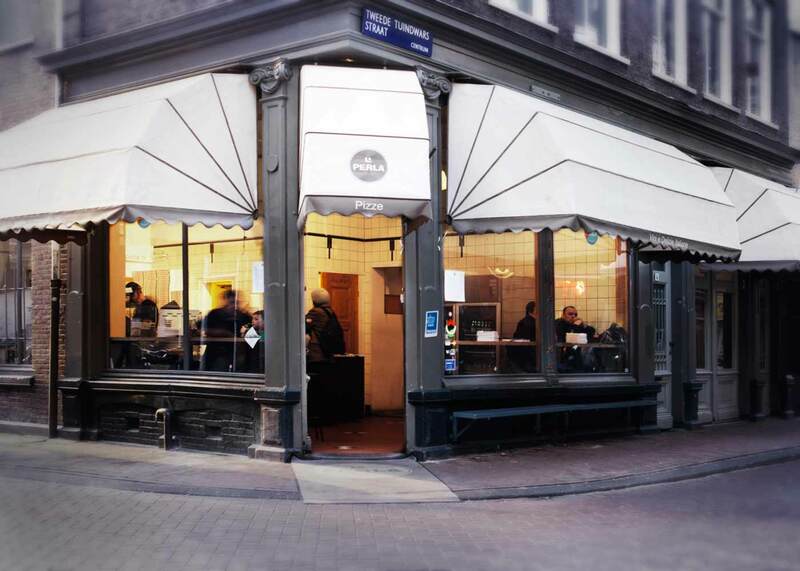 Read on and find out what stone-oven goodness Amsterdam has to offer. Located in Amsterdam’s charming Jordaan neighbourhood, La Perla’s pizzas have picked up quite the reputation for quality. 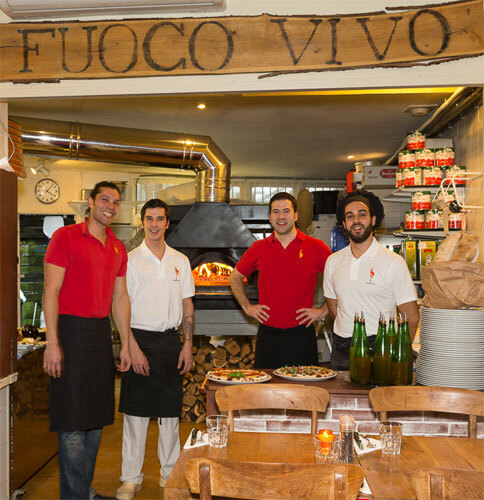 With mouthwatering ingredients imported weekly from Italy and baked to perfection in a wood-fired oven, it’s no wonder that finding a table here is so difficult. 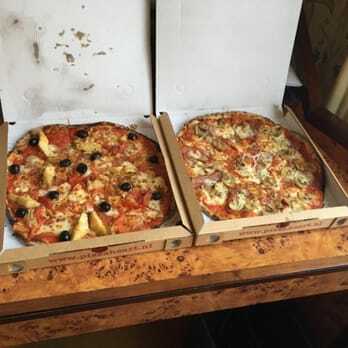 Thankfully, while La Perla doesn’t deliver, you can order your pizza to go. Specializing in sourdough pizzas, Fuoco Vivo is another favorite of Amsterdam pizza-lovers. Regularly scoring high reviews on tripadvisor and facebook, this joint’s secret is in its sourdough yeast and its organic ingredients. Some of the delicious sausages and cheeses served here are made on site. Inside, the restaurant is warm, traditional, and totally deserving of its hype. Deciding where to order a late night pizza from can be tricky. However, Pizza Heart’s existence makes this decision much easier. Thin, crispy, and topped with rich tomato sauce and mouthwatering mozzarella, this pie stands head and shoulders above the usual delivery offerings. 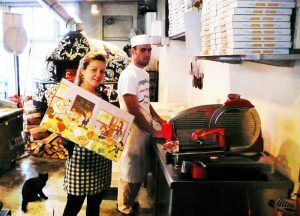 A steady stream of customers keeps Pizza Heart’s stone oven hot all evening long, and delivery is speedy. Highly recommended. Just around the corner from the lush Sarphatipark, this small but atmospheric restaurant serves up delicious pizzas with a traditionally Italian range of toppings. 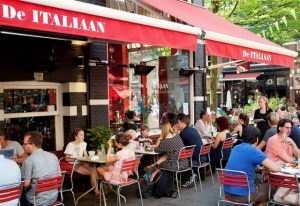 Summer in Amsterdam is a great time to sit outside with good food and friends, and De Pizzakamer obliges with a terrace that’s open until midnight. Better to reserve though, as these seats fill up fast. 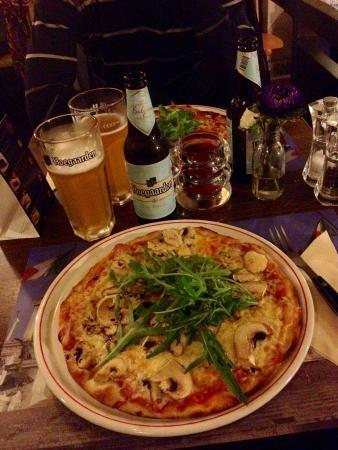 Barely a stone’s throw from De Pizzakamer, it would be a shame not to mention MangiAncora. As well as tasty stonebaked pizzas, this little trattoria sells heaps of Italian ingredients, like pasta flour and olive oils. Everything here is authentic. Even the bricks of the oven were imported from Napoli. 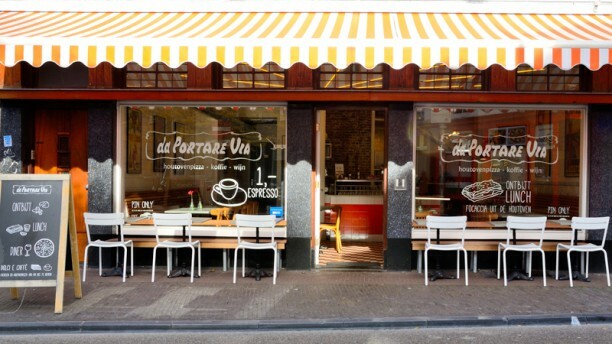 No wonder it’s a favorite of Italian expats in Amsterdam. De Pizzabakkers do pizza and Prosecco, and do them well. Now with five locations throughout the city, their pizzas range from Italian classics to more adventurously topped offerings. They’ll even give kids a ball of dough to play with while you sip your cocktail. What more could you ask for? De Pizzabakkers, Spaarndammerstraat 51; Plantage Kerklaan 2; Overtoom 501; Eerste Sweelinckstraat 16; Haarlemmerdijk 128. 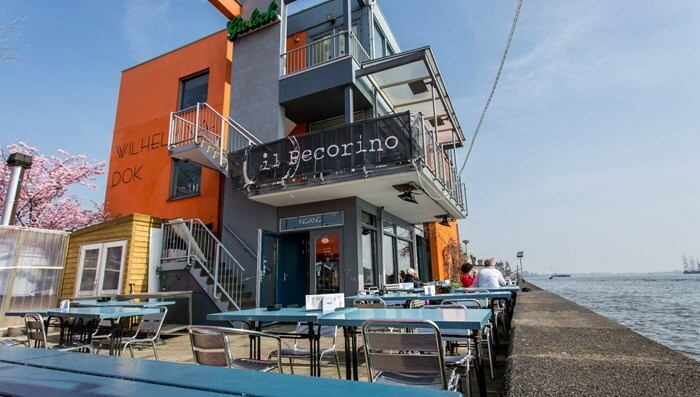 Hungry travelers who dare to cross the river Ij are rewarded at Il Pecorino. 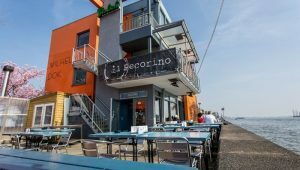 A five minute ferry crossing from central station, Il Pecorino offers pizzas, calzones and pasta with a beautiful river view. The Pizza Tonno is not to be missed, and you’d be hard-pressed to find a better pie in Amsterdam Noord. 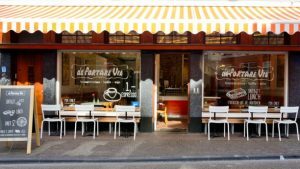 Another deservedly popular franchise, Da Portare Via serves up a selection of pizzas and deserts at five locations in Amsterdam. The Tartufo with black truffle and mascarpone is a winner, but everything on the menu here is top quality. Serving a whole array of antipasti, pasta dishes, meat and fish, De Italiaan is much more than a simple pizza joint. 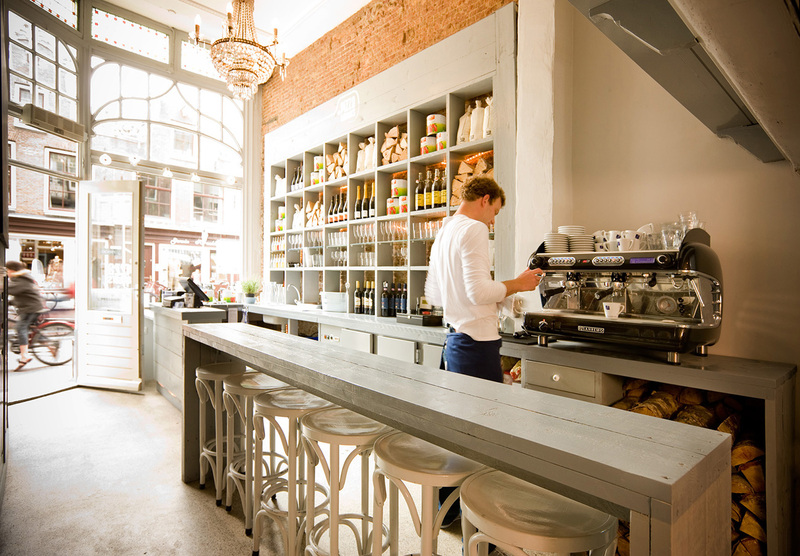 Rather, it’s a charming two-floor restaurant that happens to also serve great pizza – including gluten-free options. 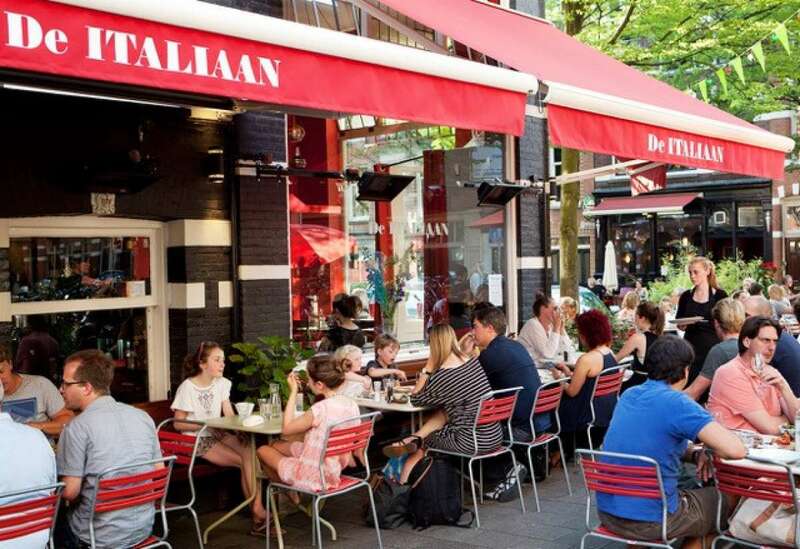 Situated on a quiet street corner in the west of Amsterdam, the terrace at De Italiaan is the perfect place to relax on a summer evening with great food and wine. In a city teeming with pizzerias and steakhouses of dubious quality, La Roma is a hidden beauty. 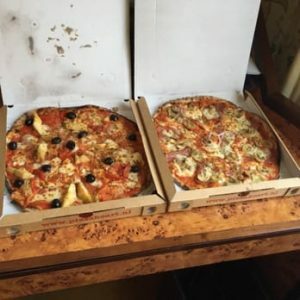 While this place most definitely looks more like a snackbar than a restaurant, the pizza is perfectly thin-crusted and comes with a bewilderingly large selection of topping options. La Roma definitely leans more towards comfort food than fine dining, but offers big, satisfying portions and is totally worth checking out. What do you think about these ten pizza restaurants? Did we miss any hidden gems out there? Get in touch and let us know!